Our outdoor garden is now completely planted. 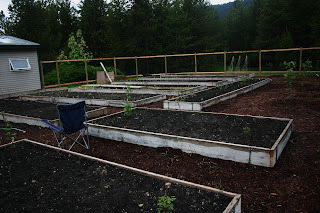 We could have planted some things (peas, potatoes, onion sets, garlic) earlier, but have been so busy with garden construction that some plantings were delayed a bit. 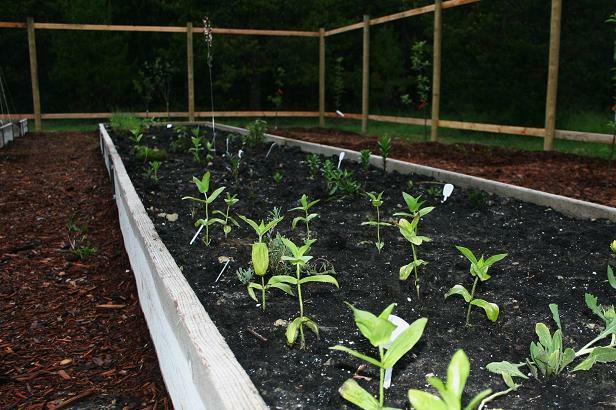 Our area's last frost date is June 1, so the tender crops were planted according to schedule. We're still waiting on quite a few bareroot plants (daisies, butterfly bush, blanket flowers, hostas, astilbe, trillium, ferns) to make their appearance. Those got planted out about 3-4 weeks ago. I'm already looking forward to next year when we have some well established perennials to add greenery to our early spring garden. Here are some pictures to show our progress outdoors. I'll post an indoor update later in the week. Below is an astilbe (I think) planted out in the shade bed behind the greenhouse. This is the only bed that is mulched, eventually we'll put a layer of mulch on all the perennial beds. A butternut squash. The winter and summer squash and cucumbers don't seem to mind the recent cool rainy weather. Something really likes my swiss chard below. I can't figure out what it can be.. it's not Jeff, the dogs, a deer, or a rabbit... What could this be? This mystery pest has been chowing down on my chard, fennel, sunflowers, cabbage and kohlrabi. 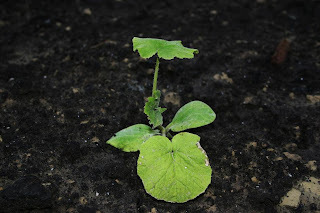 It's chewed things off at the stem and left a leaf or two as evidence. No snail trails have been spotted. Any ideas? We're putting out a garlic/cayenne/neem/soap spray to deter a variety of critters since we're stumped. Our potato plants are poking their heads up out of the ground! I can't wait to for these to get bigger and to be able to harvest baby potatoes. We planted the potatoes in 10 inch deep trenches in the garden. 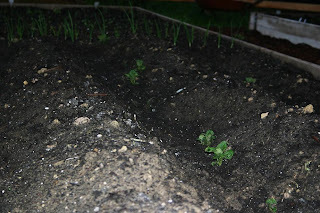 As the potatoes grow bigger we'll gradually add more the dirt back on them. 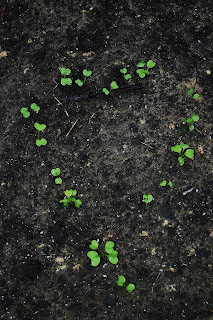 Below are some radishes planted under a pea trellis. 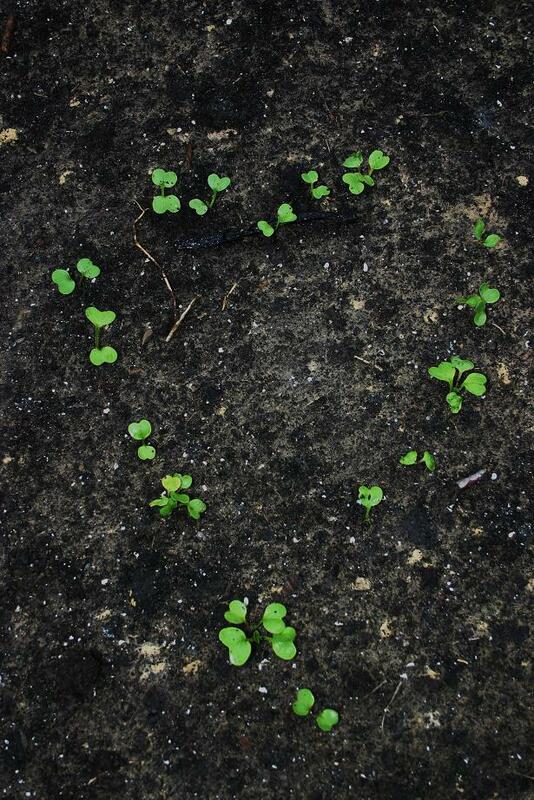 I got bored of trying to plant in straight lines everywhere so started planting shapes in the garden. Why not? These radishes got planted in a heart shape, the garlic in a spiral, and the carrots in wavy parallel lines. 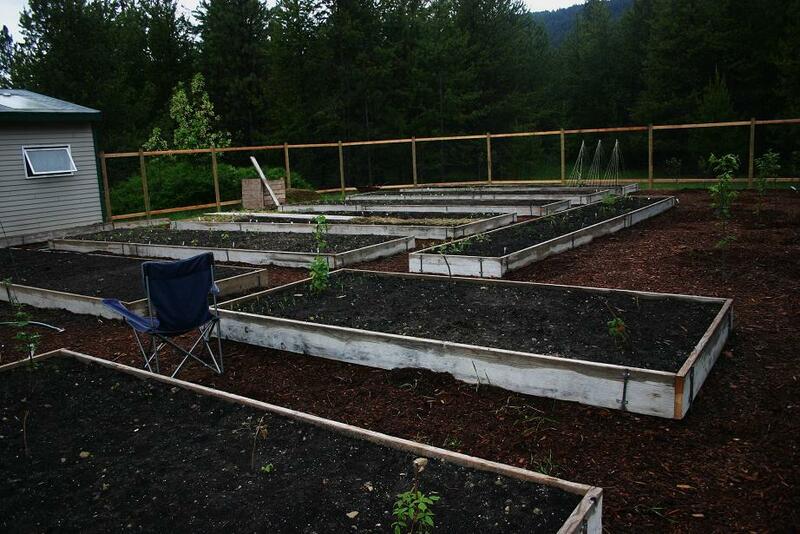 Here are some pea trellises that I made. Not the most durable things in the world, we'll see how they do. 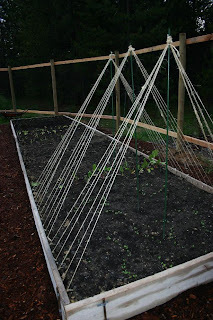 For the other trellises that are needed, we've decided just to use stakes and chicken wire. That seems like the most practical, affordable and movable trellis style. As neither Jeff or I had ever grown onions before, we're growing some from sets and some from seeds to see what works best for us. Betcha can guess which ones are from sets and which from seeds. 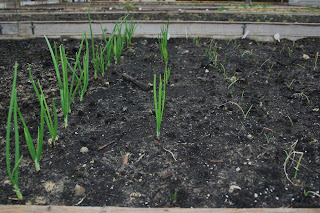 The seeded onions (on the right, obviously) were started February 1st in our germination station, moved to the solarium, and then the greenhouse before being transplanted about 3 weeks ago. I'm not sure what we should have done differently to make these bigger. They weren't even close to being root-bound, so I don't think pot size was a problem. I know that with other plants (tomatoes, peppers) I spent too much time trying to harden things off - about 4 weeks. I guess there is a good chance that this is what I did wrong with the onions. Next year I think I'll keep all of my transplants in the solarium and start hardening off plants just a week before planting. 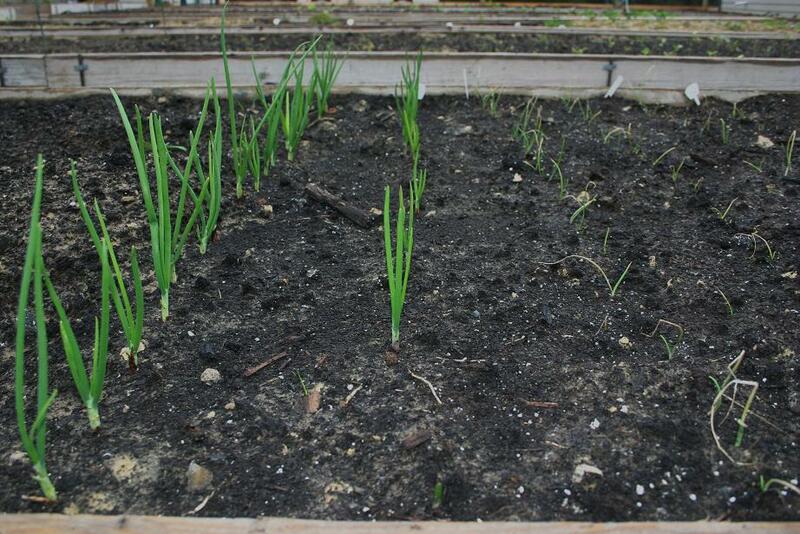 Any additional input on growing better onion transplants? I did OK growing marigold transplants. This is the first marigold to flower in our garden. About 40 of these are planted in the flower bed, among the carrots and tomatoes. Our perennial/annual flower bed is pictured below. Eventually this will contain winter hardy gladiolas, stargazer lilies, lavender, lupine, blanket flowers, goblin flowers, shasta daisy, alaska daisies, bee balm, butterfly flower, coreopsis, creeping thyme, and phlox. In this picture you can pretty much just see some zinnias, marigolds and lilies. The zinnias and marigolds were started from seed about 8 weeks ago and I'm pretty happy with the way those turned out. Well, that is what we've been up to. Any input on things we can do to help control pests or for growing better transplants next year is appreciated. Everything is looking really good. I love the radish designs, how fun. 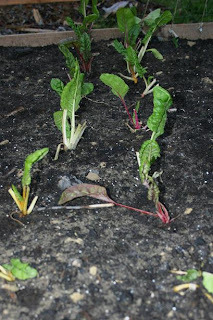 Wow, my guess would have been a rabbit that chewed off the chard leaves but other than that I would try to go out late at night or really early in the morning with a flashlight and see if it is some sort of nocternal bug...I know, easier said than done. I have had mice do that to our spinach leaves before, you could try a trap baited with peanut butter just to see. It just does not look like bug damage to me. I think you have a caterpillar eating your plants. I had the same think last fall that devastated my greens. Finally I saw tiny caterpillars like the kind on broccoli chewing away. I was sure it was rabbits or deer, but I don't think so now.